Dartmouth N.S. – Friday, Mar. 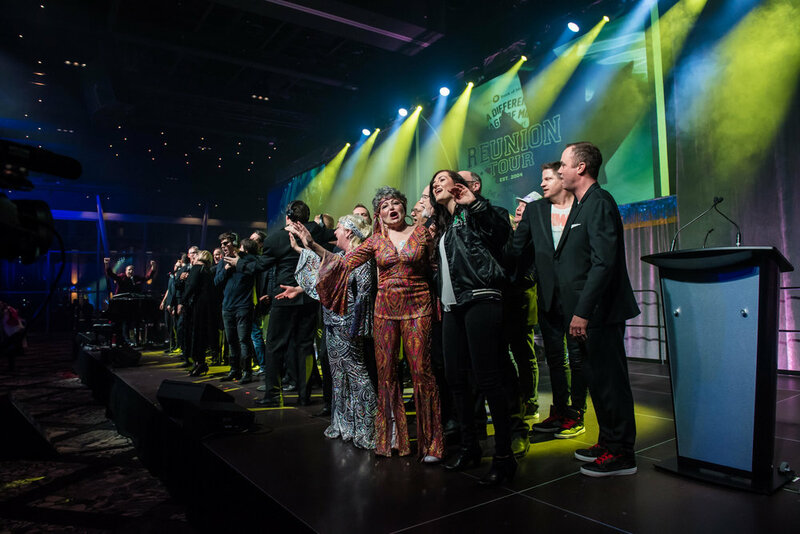 23 was a hugely successful night at the new Halifax Convention Centre as the Mental Health Foundation of Nova Scotia’s premiere fundraising event A Different Stage of Mind set a fundraising record. Hosted by DSOM alumni Nancy Regan, four of our most well-known and talented returning acts graced the stage for the 15th anniversary reunion tour in front of a sold out crowd of more than 850 people. Our four returning acts were committed to raising $100,000 each through tickets sales, fundraising, sponsorships and live donations during the event. Every act exceeded its goal. Gladys and Mabel raised $105,750, The Emera Eagles raised $280,675, The BMO Wealth Pack raised $107,939.15 and Robert Zed and the Men of the Deeper Pockets raised $113,442. Overall the event brought in an amazing $616,000 and we’re still receiving donations today! Robert Zed and the Men of the Deeper Pockets kicked off the star studded evening with a reunion of previous DSOM performers including BMO’s Mike Bonner and Louise Bradley President/CEO of the Mental Health Commission of Canada. Gladys and Mabel (Paula Bond and Barb Hall) took us on a reunion of Saint Mother of Mary’s Catholic School. The People’s Choice Award winning BMO Wealth Pack got the Convention Centre on its feet with everything from Sinatra to the Backstreet Boys. The Top Fundraiser Award Winning Emera Eagles took us to Hotel California. Finally, all the acts returned on stage for a heartwarming rendition of Tears are Not Enough. Elsie Morden from the No Time for That anti-bullying society also performed. Mental Health Foundation of Nova Scotia President Starr Cunningham urged the crowd to “keep the conversation going and to look forward,” in her address to the crowd. The Mental Health Foundation of Nova Scotia wants to extend gratitude to all our sponsors and supporters. Special thanks to presenting sponsor: BMO Bank of Montreal; Event Sponsor: ZedEvents; Media Sponsor: CTV News Atlantic; Branding Sponsor: Revolve; Video Sponsor: RPM Productions; A/V Sponsor: FMAV; Location: The Halifax Convention Centre; Photographer: Stoo Metz; Band Leader: Stevie Dooks and Printing Partner: Atlantic Digital Reproductions.